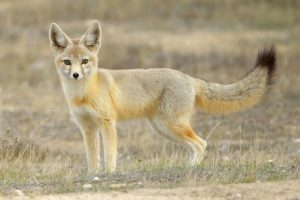 The Kit Fox is a species of North American foxes that are known in many names, including desert fox, zorra del desierto and zorra norteña in Spanish, and wüstenfuchs in German. Known for their large ears, bright eyes, and ‘cute’ looks, they are extensively found in many zoological gardens of the world. Size: The average length of the body is 455 to 535 mm (17.9 to 21.1 in), excluding the tail. Weight: An average specimen weighs between 1.6 and 2.7 kg (3.5 and 6.0 lb). Fur/hair/coat: The coat is mostly gray having rusty tones scattered all over the body. Body: A short elongated body structure with two pairs of short legs. Ears: The ears are relatively larger than the head/face, measuring between 71 and 95 mm (2.8 and 3.7 in). Eyes: Long, almond-shaped eyes that apparently looks dark in color. Nose: A tiny pair of black nostrils set at the tip of an elongated snout. Tail: The tail is long, with the color changing with the color of the rest of the body hair from season to season. The tip of the tail is black. Sexual Dimorphism: There are not many visual differences between the sexes, with the males being slightly larger than their female counterparts. The longevity of the kit fox is 4-7 years in the wild and as long as 14 in captivity. 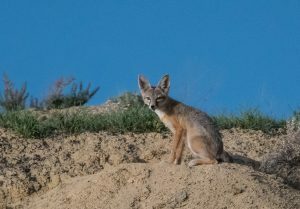 Kit foxes are primarily found in the southwestern regions of the United States, as well as in the northern and central parts of Mexico. 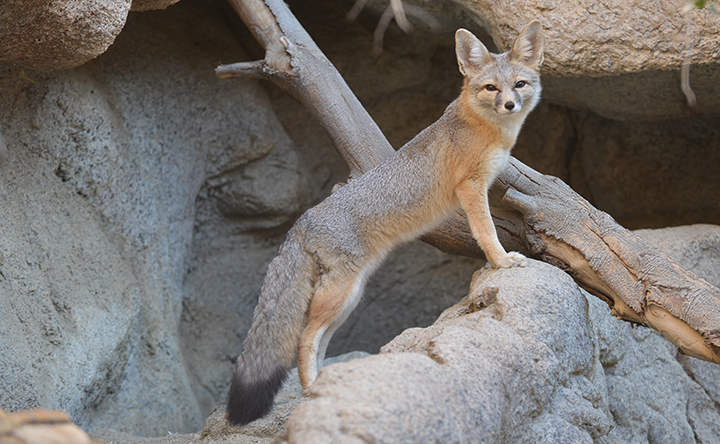 The kit fox prefers dry, arid climates like in the desert scrubs, chaparrals, and grasslands. 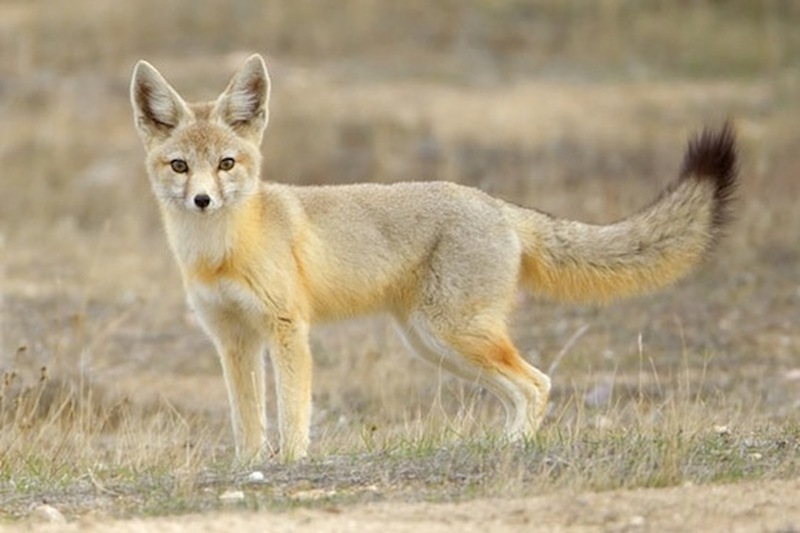 Kit foxes are usually solitary creatures, spending life all alone except for the mating season. Because they primarily live in the hot, arid desert areas, they remain relatively inactive during the daytime inside their dens and coming out at night. However, they have been seen during the day as well, foraging for food. 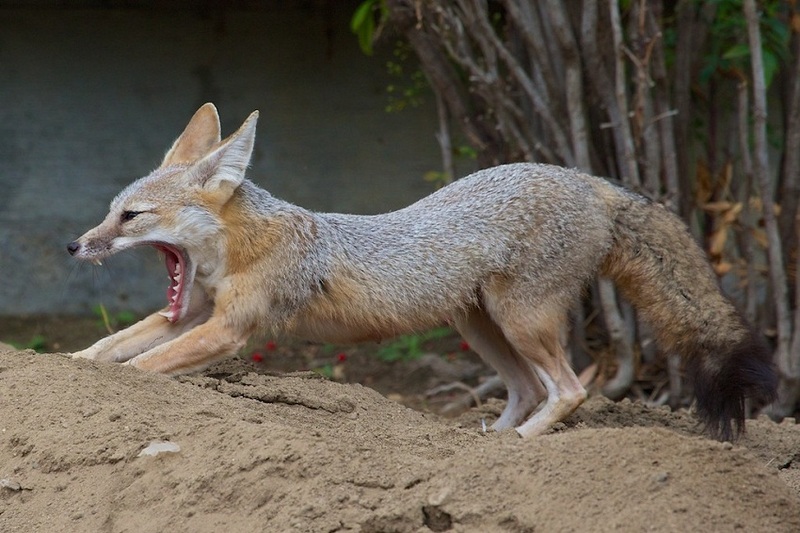 They are not too much territorial, only guarding their burrows, where they live in small families. A single territory may be overlapped by two or more groups, and they do not fight for that. They usually make sure that they do not move out to forage together. 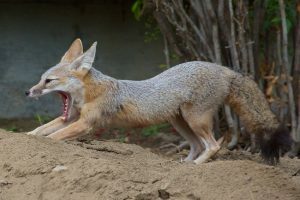 Like other fox species, kit foxes give out normal fox calls, but at times they send barking sounds at perceived threats or even a ‘hacking growl’ during encounters. 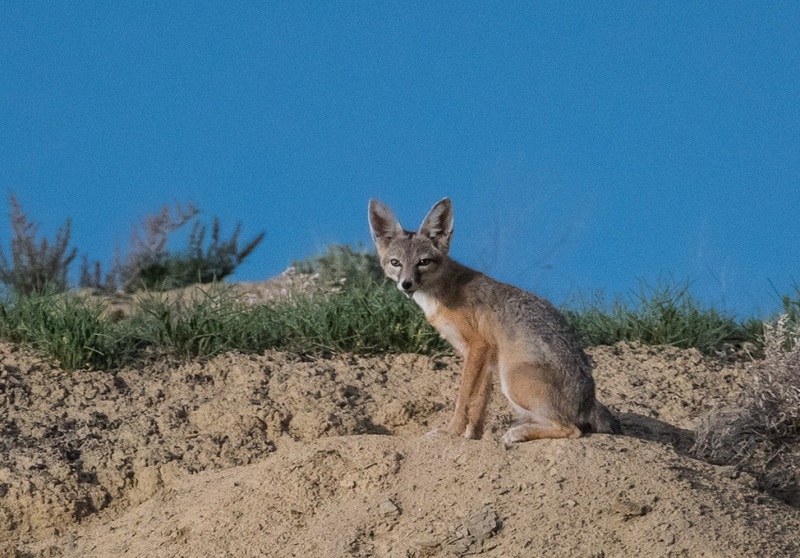 Kit foxes usually feast upon small animals like cottontail rabbits, kangaroo rats, meadow voles, hares, prairie dogs, lizards, snakes, fish, insects, and several species of ground-dwelling birds. They will also scavenge carrion. Several studies have revealed that these foxes are monogamous, forming pairs for mating that lasts for a lifetime. However, there are exceptions, with some individual reportedly practicing polygamy in some cases when a single male has been observed copulating with multiple females. When the vixen is sexually equipped to reproduce, it moves out by itself, searching for a den of her own. The mating season of these foxes commence in around the month of September. By October, a male fox joins it, as both of them remain together until the end of the pupping season. 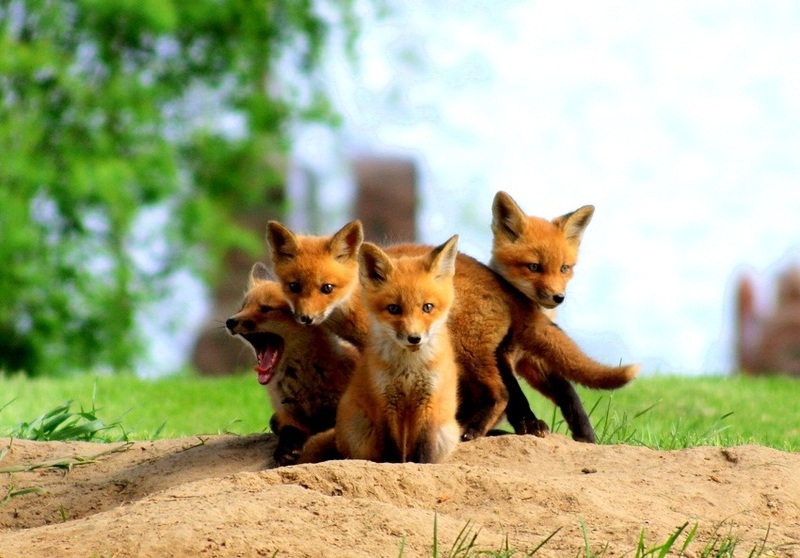 The gestation period of the vixens is 49 to 55 days, as they give birth to the offspring in early spring. Each litter consists of 1 to 7 babies, with the average being 4. The baby foxes are born hairless, without vision, and depend completely upon parental care. The father fox moves out in search of food for the young ones, while the mother takes care of them, when alone. The juveniles wean at around eight weeks and begin to hunt with the assistant of their parents when they are 3 to 4 months old. 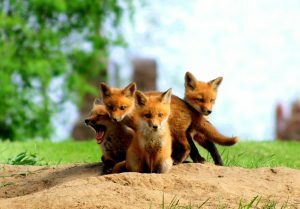 They become independent by the time they are 5 to 6 months old and disperse from their parents usually at eight months. Both the young male and female attain the age of sexual maturity when they about ten months. 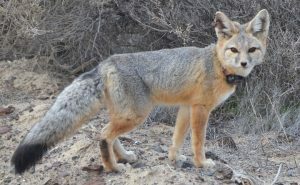 Despite living in the arid regions, these foxes do not need much water to drink since their bodies derive enough moisture to survive from their prey. Their large ears assist them to lower their body temperature, as well as, hear even very low pitch sounds so as to alert them from any approaching enemy. The short legs help them run fast in the desert sand without getting much resistance. The paw pads of these animals have hair, which helps them protect their feet from the scorching desert sand. The fur on their body keeps changing color with climate to help them camouflage easily in the barren desert. 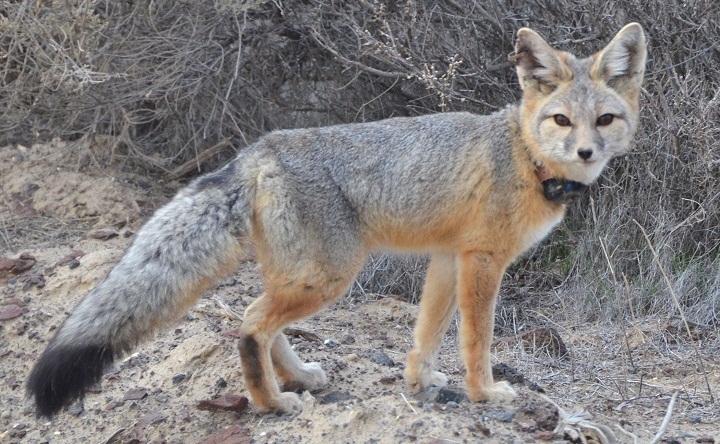 Coyotes, American badgers, feral dogs, bobcats, red foxes, and different large raptors are known the common enemies of the kit foxes. Humans are also known to hunt them for fur. 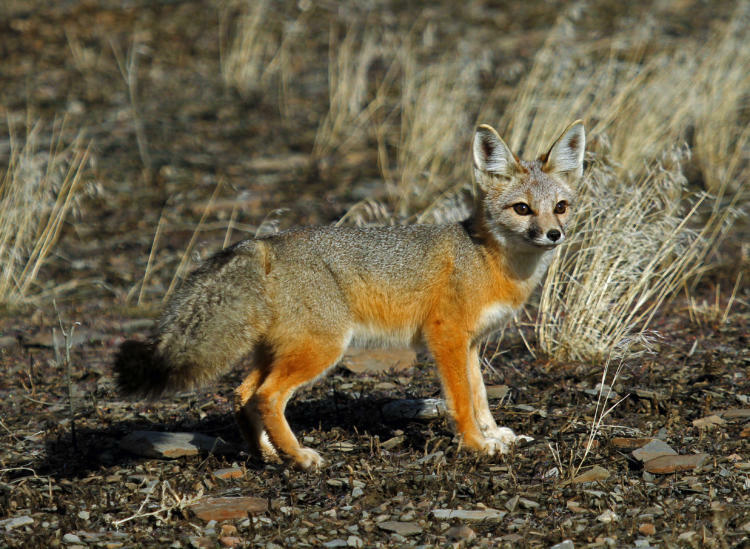 The IUCN 3.1 have categorized these fox species under their ‘LC’ (Least Concern) list. 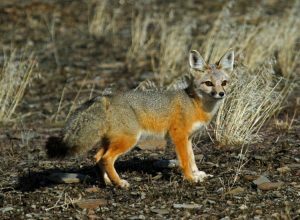 There is a similar species in the US, the swift fox, which has a strong resemblance to the kit fox, and some taxonomists claim that both these foxes are same species. When food is scarce, the carnivorous fox has been reportedly seen eating a few specific fruits, especially tomatoes and cactus fruits. There are many instances of kit foxes being good pets to humans.